You know who they are. 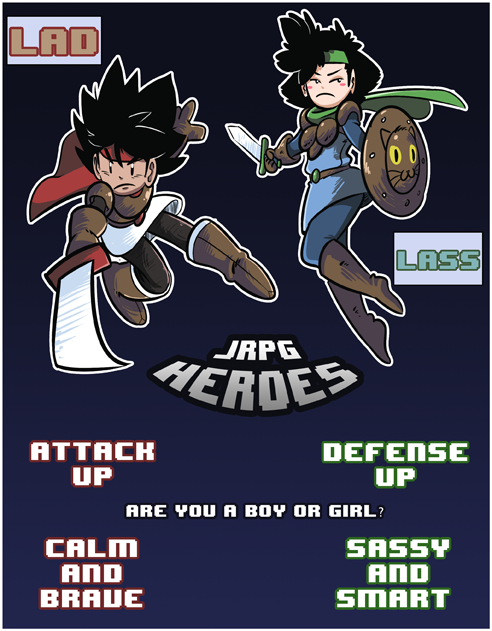 They're JRPG heroes! They are looking for their next adventure. Somehow they wandered into Void. They are two separate entities. You don't draw them together, you choose one. Lad focuses on offense, a.k.a attacking. He is brave and likes to help people. Lass likes to counter, a.k.a defending. She is sassy but helps people reluctantly. Both are competent. They are silent protagonists. Yes, that means they cannot speak.